Take Road House, mix with Hard Boiled, add a ladle of gumbo, and you pretty much have 1993’s mullet-tastic Hard Target. Starring the ‘Muscles from Brussels’ himself, Jean-Claude Van Damme, Hard Target is 97 minutes of Cajun-flavored insanity. But, unlike my twin brother we don’t talk about, this is the good kind of insanity. Hard Target is a John Woo film, so toss all concepts of reality and physics out the window. Which is fine. The action in Hard Target is so insane, it touches on brilliance. Like most Woo films, there is plenty of gunplay—but there is also upside down gunplay. Yes, Van Damme fires a handgun upside down at one point. It is jaw-droppingly crazy. Let’s rewind a bit though. Hard Target is a ‘man hunts man for sport’ story, or to be more specific, ‘the rich hunt the poor and homeless for sport.’ It makes one wonder why they don’t reboot this for today, ’cause I’m sure the 1% would eat this up like caviar at a yacht club ho-down. Representing the poor and the homeless is Van Damme, as Cajun street fightin’ man, Chance. So named because ‘his mama took one.’ The hunters are Lance Hendrickson, the guy who played The Mummy in The Mummy, and a bunch of other toughs, including frequent Arnold Schwarzenegger foil, Sven Thorsen. While there is plenty of gunplay, including a few crazy guns (even one what shoots arrows), Van Damme’s martial arts skills are given loads of screen time. In fact, one could play a drinking game based on Van Damme knocking cigarettes out of mouths and sunglasses off of faces. There are three shining jewels in Hard Target, which make it worth a watch alone. First, Van Damme’s mullet. It is the stuff of legends. 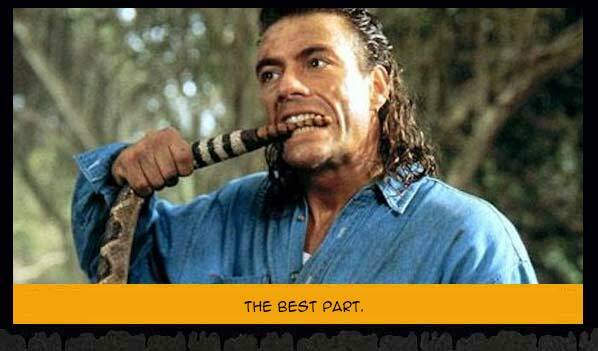 If you looked up ‘Kentucky Waterfall‘ in the hair dictionary, there would be a screen capture of Hard Target. Second, the infamous ‘snake-punching’ scene. Van Damme shows he has a way with nature—by beating the ever-living crap out of a snake puppet. The cherry on top is Van Damme doing the bayou version of St. Patrick, and biting off the snake’s rattle (Van Damme has his reasons). The last jewel in Hard Target‘s triple crown is Wilfred Brimley. Yes. 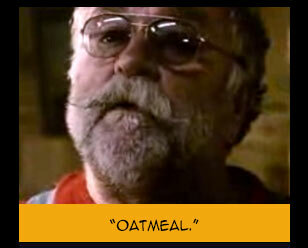 Mr. Oatmeal plays Van Damme’s moonshiner, swamp dwelling uncle—complete with a Cajun accent. I like to think Brimley was the inspiration for Katniss in The Hunger Games, because he is an ace with the bow, and if you squint real hard, he kinda looks like [what’s her face]. An’ don’t go thinking Hard Target is all snake-punching and fancy kickin’ neither. There is plenty of motorcycle action too—mostly EXPLODING motorcycles (it is a John Woo movie after all), the best of which is the scene where Van Damme STANDS UP on a moving motorcycle to shoot bad guys. If you have an itch for an over-the-top, physics ignoring action film, then Hard Target is the scratch you need. Tiger says, Hard Target is a must watch. People get shot, kicked, stabbed, blown up, and bit by snakes. 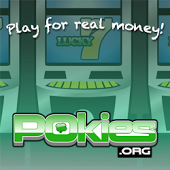 You see a pair on an ad for an adult business. That’s it. Van Damme and those hunting him count as beasts, because why not? 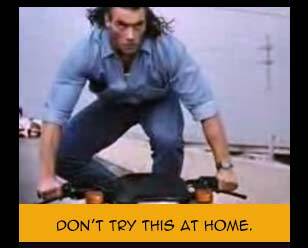 Now here’s a helpful b-movie survival tip from Hard Target!